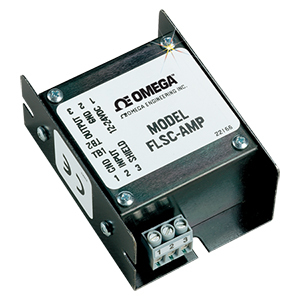 The OmegaTM FLSC-AMP amplifies the low level signals from the magnetic pickup of gear teeth or flow transmitters by a factor of more than a hundred times to drive any Omega ratemeter, counter or controller. It is mounted in a rugged 2 x 3" metal housing with screw terminals for easy installation. The low voltage line from the magnetic pickup to the FLSC-AMP should be less than 3 m (10') in length, shielded and isolated from relays, solenoids or other sources of electrical noise (let the output line make the long run). If the input is too sensitive, lower the 1.1K input impedance by adding a 220 to 1 KO resistor across TB1, pins 1 and 2, to increase noise immunity. Compatible with paddle wheel sensors and turbine meters. Examples : FP-5300, FTB-100, FTB-900 connected to FLSC-AMP to DPF70 series panel meters.